Key words: course, courses, calculus, Dirac interference, Dirac's notation, electromagnetism, Feynman, Fourier, interferometric, interference, introduction, instruction, laser, laser physicist, lecture, linewidth, Newton, quantum, teaching, university, university degree. Note: also available: Understanding lasers in simple words. Newtonian mechanics: this is the soul of a physicists. Understanding Newtonian mechanics teaches you how to think. It also requires a good knowledge of the tools of geometry and calculus. On the practical side you should gain a basic understanding of mechanical engineering and vacuum physics. Electromagnetism: Maxwell equations in particular and all the mathematical tools needed to handle them. On the practical side you need to know how to design and build transmission lines and high voltage power supplies. Quantum mechanics: I prefer the Dirac version of quantum physics. 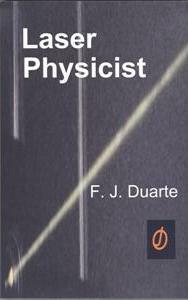 Dirac's quantum physics opens the door to understanding the principle of stimulated emission, Heisenberg's Uncertainty Principle, and the essence of interference which is the heart of physical optics. Understanding the Schrödinger equation, and its applications, is necessary and knowledge of the density matrix formalism is also useful. In addition, you will need a background in various branches of mathematics such as matrix algebra, Fourier theory, Laplace transforms, Legendre polynomials, and differential equations. Once the fundamentals are in place you can familiarize yourself with solid state physics and gain media in the liquid and the gas phase. Now some observations about optics: once you have all the basic tools in your archives you should be able to study and master the principles of geometrical and physical optics. Optics is beautiful and this endeavour should be fun. One aspect not mentioned previously, and essential to build new lasers, is manual ability. The alignment of a laser requires excellent eye to hand coordination. Optics demands a delicate and clever touch. You should be able to develop this skill interacting with simple opto-mechanical projects. The earlier the better. Learning and becoming familiar with the topics just outlined can take years of study even after a first university degree in physics or optics is completed. The truth is: you'll never stop learning. However, after some level of competency is reached and after your peers recognize you as a laser physicist you will find that you will be able to contribute beyond the boundaries of laser physics. Indeed, you should be able to design and build optically-based instrumentation for industrial, scientific, medical, and astronomical applications. In other words, you will become an excellent experimental physicist with a sound understanding of useful theory. Besides the pleasure and joy of observing your creativity at work you might even encounter the rare privilege of making a few discoveries of your own... and remember always... walk as children of light (Ephesians 5). M. Born and E. Wolf, Principles of Optics (Cambridge University, Cambridge, 1999). P. A. M. Dirac, The Principles of Quantum Mechanics (Oxford, London, 1978). W. Demtröder, Laser Spectroscopy: Basic Principles, 4th Ed. (Springer, Berlin, 2008). J. C. Diels and W. Rudolph, Ultrashort Laser Pulse Phenomena, 2nd Ed. (Academic, New York, 2006). F. J. Duarte, Newton, prisms, and the opticks of tunable lasers, Optics & Photonics News 11 (5), 24-28 (2000). F. J. Duarte, Tunable Laser Optics 2nd Edition (CRC, New York, 2015). R. P. Feynman, R. B. Leighton, and M. Sands, The Feynman Lectures on Physics, Vols. I-III (Addison Wesley, Reading, 1965). C. Kittel, Introduction to Solid State Physics (John Wiley, New York, 1971). P. Lorrain and D. Corson, Electromagnetic Fields and Waves (Freeman, San Francisco, 1970). I. Newton, Opticks: or a Treatise of the Reflexions, Refractions, Inflexions and Colours of Light (Royal Society, London, 1704). I. Newton, Principia Mathematica, (Royal Society, London, 1713). J. C. Ward, Memoirs of a Theoretical Physicist (Optics Journal, Rochester, New York, 2004). “… interference can be analyzed via the interaction of probability amplitudes. These probability amplitudes are said to be represented by wave functions. Hence, interference can be described via the multiplication of an addition of complex wave functions, with its corresponding complex conjugate… Dirac writes about a [monochromatic] beam of light consisting of a large number of photons… In the case of a large number of indistinguishable photons his words are just fine” . "The Dirac discussion... begins with reference to a beam of roughly monochromatic light; then prior to his dictum on interference, he writes about a beam of light having a large number of photons... In present terms this is no different than the description of interference due to the interaction of a high-power narrow-linewidth laser beam with a two-beam interferometer" . In the previous description a key concept is that a beam of monochromatic light is a beam is indistinguishable photons which is equivalent to a beam of narrow-linewidth laser emission . 1. F. J. Duarte, Interference of two independent sources, Am. J. Phys. 66, 662-663 (1998). 2. F. J. Duarte, Tunable Laser Optics 2nd Edition (CRC, New York, 2015) Chapter 2. In 1965 Feynman used Dirac's notation to describe the mechanics of population inversion and applied his development to dye molecules prior to the first reports on tunable dye lasers in 1966. Amazing? This is mentioned in Tunable Laser Optics, Chapter 1. Note on laser safety: a laser laboratory must always be neatly organized and very clean. A laser laboratory is not a place for chaos or dust. Further, always follow the safety recommendations applicable to the class of laser at hand. Ignoring these observations could have extremely grave consequences. First published on the 12th of March, 2005. ; Updated on the 24th of March, 2015.